A user can be restricted to only see and change certain sections or parts of ftrack and this is entirely up to the user administrator. Everything regarding permissions can be changed in the permissions and roles system. Custom roles can be set up that restricts what a user can do and not do and these roles can be assigned to specific users depending on needs. ftrack comes with four default roles that fits most studios but sometimes you want to be more detailed on what can be seen and changed. The Roles page in Settings can be used to add, edit and remove roles. This user can only see the project he/she is assigned to and only change the status on assigned tasks. This user can see all projects and can change the status on all tasks. 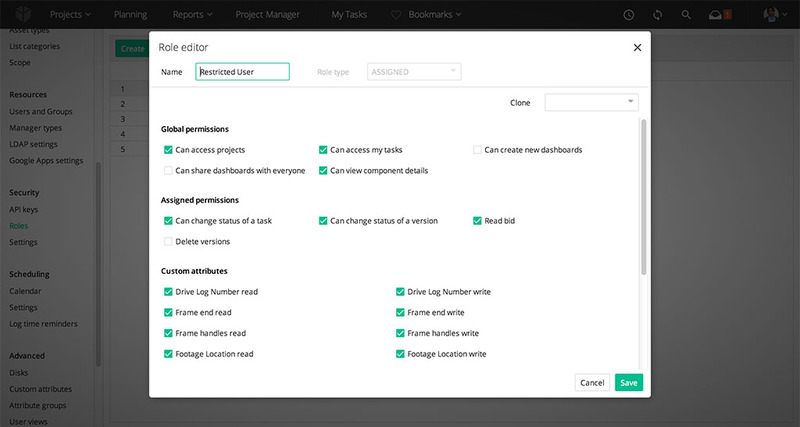 Project manager:This user can create, edit and remove projects and project related objects (except users). This user can change everything in ftrack, add and remove users and see all data in the system. In the dialog that appears, enter a name for the role and select the type of role you would like to create. Currently there are two role types: Assigned and Project. The difference between them is which projects they applies to. Depending on role type selected you may now select what the role should be able to do and not do by checking and unchecking the boxes in front of the actions you want the role to have. If you want to base your new role on an existing one, you can clone it and save it as a new role by selecting which role you want to base it on in the Clone drop down and then make your changes. To edit a role, click the edit icon in the shortcuts column on the corresponding row to a role you would like to edit. The same dialog as when adding a role is opened and pre-entered with the settings of the role. Click Save when finished. To remove a role, click the trash can icon in the shortcuts column. A dialog will appear to let you confirm the removal. Go to Settings and then the Users page. Click the roles icon in the shortcuts column on the corresponding row to a user you want to edit the roles for. 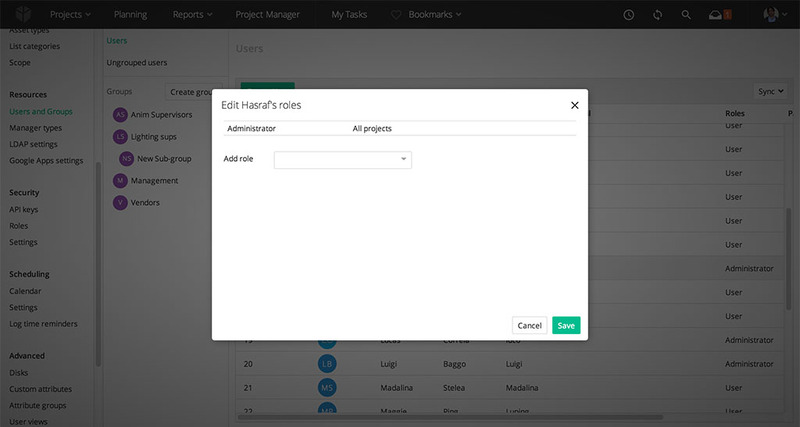 In the dialog that appears, you can add and remove roles assigned to the user but also set more specifically which projects you want the role to be applied on. With the role editor you can customise your roles completely from bottom up. From being allowed to only see a specific dashboard to being allowed to only change and save a value in a custom attribute you have very good possibilities to decide what a user with a specific role should be allowed to perform. When creating a new role it’s as easy as choosing a name for it and then selecting permissions by checking the boxes for what the role should be allowed to perform. ASSIGNED role type will only be allowed to perform actions that he/she has permission to perform on assigned tasks. 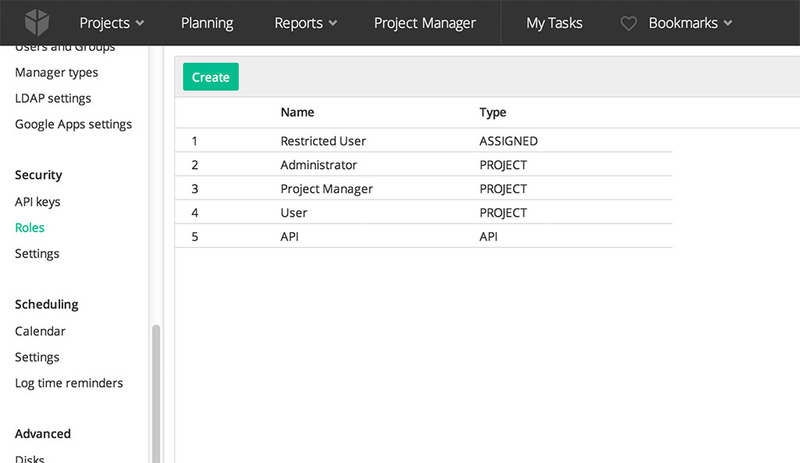 This will also limit the user to only see projects with tasks he/she is assigned to. PROJECT role type will be allowed to perform actions that he/she has permission to perform project-wide on specified projects.